DMC Facilities Management are fully conversant with the use of cradles for exterior window cleaning in Leighton Buzzard. Many modern buildings now have cradle systems fitted as part of the building structure. Once on-site formalization and training has been carried out, our staff will ensure the equipment is operated safely and efficiently at all times. Our specialist high-rise window cleaning team have a great safety record and are able to operate any equipment within the strict health & safety regulations. 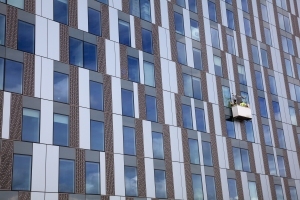 We have a number of operatives who can use cradles for exterior window cleaning and have vast experience in the use of various types of cradle systems.